Uesugi’s is known for its pumpkin pyramid, a towering orange pile built from 4,000 gourds. 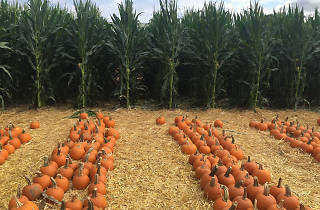 The farm offers corn mazes for every age level. Bootsie’s maze is designed for small children, with few turns to get lost in. 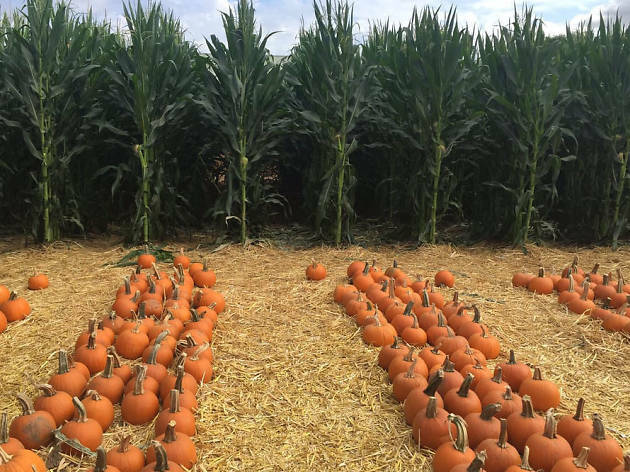 Meanwhile, Kayla’s corn maze winds over two acres and includes interactive trivia cards that nudge visitors in the right direction. Afterwards, take a hayride through fields filled with thousands of sunflowers and wildflowers, ride a train among the scarecrows, or pet ponies and goats in the petting corral. Katie's Kitchen sells everything pumpkin flavored, from pumpkin ice cream and pie to pancake mix, butter, and salsa.